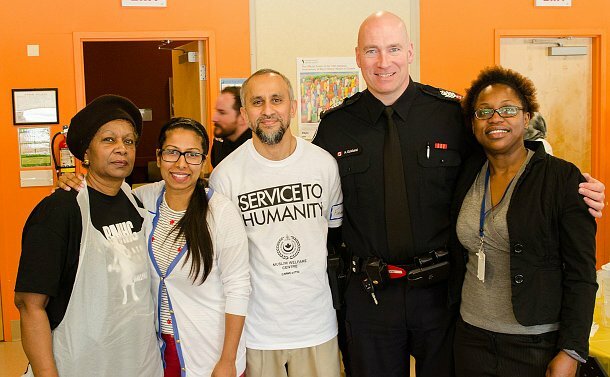 It was cold outside, but the seniors inside TAIBU Community Health Care Centre on March 2 were treated to a tasty warm meal and dessert to launch a weekly lunchtime initiative involving 42 Division. Volunteer Anita Rajroop, 1 Love Malvern's Wynette Tavares, Firaaz Azeez of MWC, Staff Sergeant Andy Ecklund and Karen Marshall from TAIBU. About 150 Malvern residents were served barbecue chicken with cajun rice and vegetables to kick-start the Malvern Eats program, conceived by the Muslim Welfare Centre (MWC) whose head office is in the Malvern community. Staff Sergeant Andy Ecklund, in charge of the Division’s Community Response Unit, said the MWC reached out to them to participate in the program. Superintendent Kim Yeandle, 42 Division unit commander, joined Ecklund and other officers in serving meals to the seniors. On Thanksgiving Day 2014, the MWC launched Regent Meals at the Christian Resource Centre in Regent Park. In the last 16 months, almost 200,000 meals have been served every Sunday between 11.30 a.m. and 1 p.m. Seniors in Malvern are served on Thursdays between 11.30 a.m. and 1.30 p.m. at TAIBU Health Care Community Centre, 27 Tapscott Rd. TAIBU, launched in 2008, and 1 Love Malvern are the other partners in the “Malvern Eats” initiative.